Bedsores are often a sign of neglect and sometimes a sign of abuse. The first thing you should do is speak to a nurse on duty and begin to remedy the situation. Be aware that the nurse may not have a full understanding of these injuries and you will likely need the attention of a wound care specialist and medical doctor. If you have a cell phone take some pictures of the wound for documentation. Bedsores and Pressure Sores, also known as Decubitus Ulcers can progress quickly and can be deadly. They occur when someone is immobile and there is not adequate blood flow. Then the affected tissue dies and an ulcerated sore develops. In a nursing home, hospital or other care facility it is their responsibility to check and turn the patient regularly. There are laws in place that protect patients and you should know that these injuries are not the fault of the patient. The patient is the victim. If a loved one you know is suffering they may have a significant, financially rewarding lawsuit. Read more about this on our website, http://www.RaphanLaw.com. As an Elder Law firm we see these cases often. 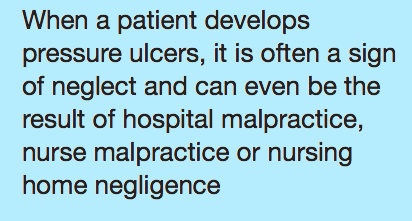 Whether malpractice, abuse or neglect it is simply unjust for it to happen to an innocent victim. Do not put off addressing the issue. Call me for a free consultation (212-268-8200, 800-278-2960) or even to just guide you through the process of getting the proper medical and legal attention. By Brian A. Raphan, Esq. BERKELEY — Engineers at UC Berkeley are developing a new type of bandage that does far more than stanch the bleeding from a paper cut or scraped knee. The researchers exploited the electrical changes that occur when a healthy cell starts dying. 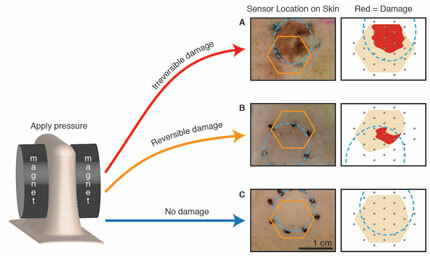 They tested the thin, non-invasive bandage on the skin of rats and found that the device was able to detect varying degrees of tissue damage consistently across multiple animals. The findings, published today (Tuesday, March 17) in the journal Nature Communications, could provide a major boost to efforts to stem a health problem that affects an estimated 2.5 million U.S. residents at an annual cost of $11 billion. Pressure ulcers, or bedsores, are injuries that can result after prolonged pressure cuts off adequate blood supply to the skin. Areas that cover bony parts of the body, such as the heels, hips and tailbone, are common sites for bedsores. Patients who are bedridden or otherwise lack mobility are most at risk. Bedsores are associated with deadly septic infections, and recent research has shown that odds of a patient dying are 2.8 times higher when they have pressure ulcers. The growing prevalence of diabetes and obesity has increased the risk factors for bedsores. 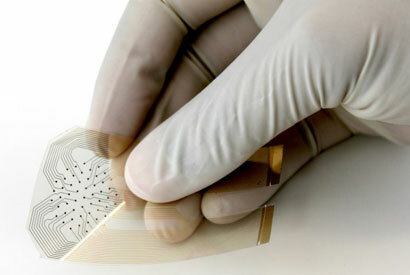 The researchers printed an array of dozens of electrodes onto a thin, flexible film. They discharged a very small current between the electrodes to create a spatial map of the underlying tissue based upon the flow of electricity at different frequencies, a technique called impedance spectroscopy. The researchers pointed out that a cell’s membrane is relatively impermeable when functioning properly, thus acting like an insulator to the cell’s conductive contents and drawing the comparison to a capacitor. As a cell starts to die, the integrity of the cell wall starts to break down, allowing electrical signals to leak through, much like a resistor. “Our device is a comprehensive demonstration that tissue health in a living organism can be locally mapped using impedance spectroscopy,” said study lead author Sarah Swisher, a Ph.D. candidate in electrical engineering and computer sciences at UC Berkeley. To mimic a pressure wound, the researchers gently squeezed the bare skin of rats between two magnets. They left the magnets in place for one or three hours while the rats resumed normal activity. The resumption of blood flow after the magnets were removed caused inflammation and oxidative damage that accelerated cell death. The smart bandage was used to collect data once a day for at least three days to track the progress of the wounds. The smart bandage was able to detect changes in electrical resistance consistent with increased membrane permeability, a mark of a dying cell. Not surprisingly, one hour of pressure produced mild, reversible tissue damage while three hours of pressure produced more serious, permanent injury. Maharbiz said the outlook for this and other smart bandage research is bright. Other lead researchers on the project include Vivek Subramanian and Ana Claudia Arias, both faculty members in UC Berkeley’s Department of Electrical Engineering and Computer Sciences; and Shuvo Roy, a UCSF professor of bioengineering. Additional co-authors include Amy Liao and Monica Lin, both UC Berkeley Ph.D. students in bioengineering; and Yasser Khan, a UC Berkeley Ph.D. student in electrical engineering and computer sciences, who fabricated the sensor array. Study co-author Dr. David Young, UCSF professor of surgery, is now heading up a clinical trial of this bandage. To learn about other bedsore and pressure sore treatments click here.